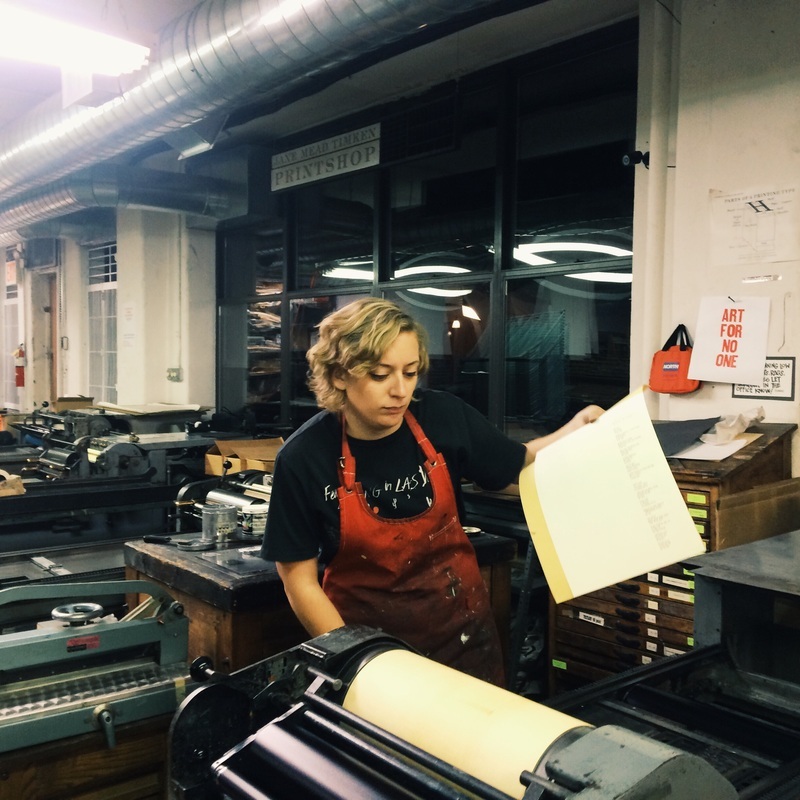 Beth printing on a Vandercook Uni I at the Center for Book Arts in New York, NY. Elizabeth (Beth) Sheehan was born and raised in the mountains of upstate New York. In 2012, she graduated with a BFA in Fine Arts with a concentration in Printmaking and a minor in Art History from Memphis College of Art. Her work has been exhibited internationally, including shows at Abecedarian Gallery in Denver, CO, Rutgers University in New Brunswick, NJ, the Center for Book Arts in New York City, and El Minia University in El Minia, Egypt among others. Sheehan’s work is in major private and public collections including the Metropolitan Museum of Art, the Robert C. Williams Paper Museum, and the George A. Smathers Libraries at the University of Florida. Her time in school fostered a passion for printmaking, papermaking, and book arts. Following graduation, she moved to Brooklyn, NY where she continued to develop her career and artistic practice for five years through artist residencies and working at the printmaking studio and publisher Harlan & Weaver, and as the bindery manager at the artist book studio Small Editions. In late 2017, Sheehan then moved to Philadelphia, PA where she continues to pursue her love of art. I find myself choosing printmaking, papermaking, and book arts processes because they each demand a substantial amount of time, effort, and attention. With each of these mediums, you build up an intimate relationship with your work at every stage of the process. This is particularly beneficial for my work because my concept is based in relational exploration. Additionally, the repetitious acts of printmaking, papermaking, and book arts also provide a cathartic experience and act as atonement as I work through and explore my concept.